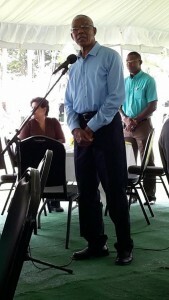 President David Granger addressing the media brunch on the lawns of State House on Sunday, January 3, 2015. President David Granger Sunday pledged “hard money” to the Guyana Press Association (GPA) to help provide training and education without any strings attached. Making the announcement at a brunch for media workers held on the lawns of State House, he stressed the importance of a well-trained media in keeping government on its toes. “I would like to pledge hard money in support of the Guyana Press Association in 2016 to organise…Once the Guyana Press Association is prepared to mount these seminars, maybe one a quarter, without intervening in the actual programme or the doctrine, the State would assist you to get the journalists together and to look after the logistics,” he said. The President floated the idea that the media, like any other professions, should consider setting standards of training and competence for persons entering the profession of journalism. “That is the problem of journalism that many people write because they could write…people write because they want to say something but it is not subject to the scrutiny of trained editors, it is not subject to the scrutiny of professionals who could guide them,” he said. The President also announced that government would be willing to assist the media to visit far-flung areas of Guyana to provide adequate and comprehensive coverage of issues and events. “We need strong media and I want to support you to ensure that new entrants into the profession are given the types of exposure and training that would give the State the critical analysis, the critical reporting that it needs to perform its functions,” he said. Granger observed that many reporters have learned from their editors or superiors who are themselves untrained in the ethics and rules of the profession. “I regard journalism as profession, not a ‘wok’ that you do until something better comes along,” he said. He, however, frowned on media houses and reporters who peddle false reports under the name of journalism rather than pursue the truth. The President praised journalists and publishers who have opted to courageously leave media houses in protest over the interference of editors in drastically changing the focus of reports. “I am very frequently pleased with journalists who walk from editors who behave in an unprofessional manner…It takes a lot of ‘guts’ sometimes to walk because that is one of the characteristics of journalism that people who can’t get along with their editors because their editors are not properly trained,” he said. Himself a journalist back in the 1960s at the Guyana Graphic newspaper, a public relations practitioner in the Guyana Defence Force (GDF) and up to recently the publisher of the Guyana Review, an analytical magazine, the retired Brigadier stressed the importance of having trained editors who could guide the young entrants in the field of journalism. The President hoped that there would be mutual respect between the media and the State because he believed that the factual unearthing of issues would help guide government policies. “I would not like to be Head of a government which is not subject to criticism. It’s not point going on and on thinking you are doing the right thing because a journalist gives a nod- give the Chief a good report. “We want to know the truth and when we find out what the truth is we will correct our performance and as a result of that the country will be all the better but if journalists don’t behave in a professional manner I think we are on slippery slope,” he said. Attendees included media practitioners from government and privately-owned media. The GPA, which turned 70 years old last year, is now expected to craft a training schedule and apply for financial assistance.